Gillingham, Ipswich Town, Artmedia Bratislava and Plymouth Argyle. A peculiar list of football teams. 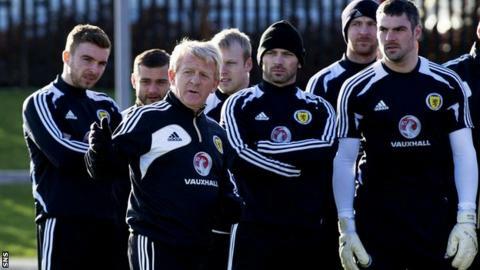 But they might be in Gordon Strachan's fleeting thoughts as he gears up for Scotland's game with Estonia on Wednesday. It's his first game in charge of the national side since being named as successor to Craig Levein in January. Although only a friendly match, the nation is desperate for encouraging signs at the beginning of this new regime. And having Estonia as Scotland's opponents at Pittodrie represents a decent chance of gleaning positives, right? Perhaps, but if the Scots do win it will mark the first time Strachan has won his first game as 'gaffer' in a new job. Scotland are the fifth side the 55-year-old has managed, following stints at Coventry City, Southampton, Celtic and Middlesbrough. Premier League side Coventry handed managerial duties to Strachan after Ron Atkinson became director of football at Highfield Road. His first game there as player-boss was against third tier Gillingham in the League Cup, and even bringing himself on as a sub in the latter stages did not prevent defeat. There were several Scottish connections in the match, with Eoin Jess, Noel Whelan, Gary McAllister and Paul Telfer all turning out for the Sky Blues. Strachan turned things round to keep a struggling Coventry side in the Premier League that season, staying up by a single point. And he remained boss of the Midlands club for the best part of five years. It was Southampton's first campaign at their new home - St Mary's Stadium - after relocating from the Dell. However, all was not going according to plan and Strachan came in as Stuart Gray's replacement. His inaugural game in charge, a Wednesday night league clash with Ipswich, ended up being a bit of a goal-fest. Former Rangers striker James Beattie scored for Saints, who were 2-0 up before being pegged back. Oh, and Ipswich's boss was George Burley. Strachan would go on to reach the FA Cup final during his near two-and-a-half-year spell with Saints, losing 1-0 to Arsenal. Strachan had succeeded Martin O'Neill and perhaps this wasn't the best way of endearing himself to Celtic fans. This Champions League second qualifying round tie in Slovakia was the stuff of nightmares. Current Celtic boss Neil Lennon was in the team on the night, but his most notable contribution was a freak clash with Chris Sutton which fractured the Englishman's cheekbone. Strachan famously claimed his watch had stopped working at full-time, meaning the horrible moment had been frozen in time as a permanent reminder. Amazingly, he almost turned it round in the return leg in Glasgow - Celtic winning 4-0 to narrowly miss out on progressing in the competition. His first season did end happily, though, securing the League Cup and Scottish Premier League title. And Strachan went on to lead Celtic to three consecutive SPL titles before leaving in 2009. Gareth Southgate had been sacked and Strachan was Middlesbrough's new man, with the Scot claiming he was attracted to "something different" at the Teesside club. Again, the harsh reality of it all was forced home in his opening contest. This time Paul Sturrock played the part of 'nemesis' as his Plymouth side got themselves an excellent away victory in the Championship. On the score-sheet at the Riverside that afternoon was none other than Jamie Mackie - who features in Strachan's squad for the Estonia game. And so, a little over two years after leaving Boro, Strachan embarks on his fifth managerial mission still looking for that elusive opening match victory. Most Scotland fans are happy with his appointment and there's real hope he can get the team off to a positive start. That's as long as Motherwell's Henrik Ojamaa and his Estonian cronies don't throw a spanner in the works at Pittodrie. More to the point, actually, let's just hope Estonia turn up this time (do an online search).